Mabel Cody performing on Vilano Beach, 1924. Photo courtesy of the Florida Photographic Collection. Mabel, who claimed to be the niece of Buffalo Bill Cody, was the star performer in Mabel Cody’s Flying Circus – one of the early groups of barnstormers touring the Southeast. 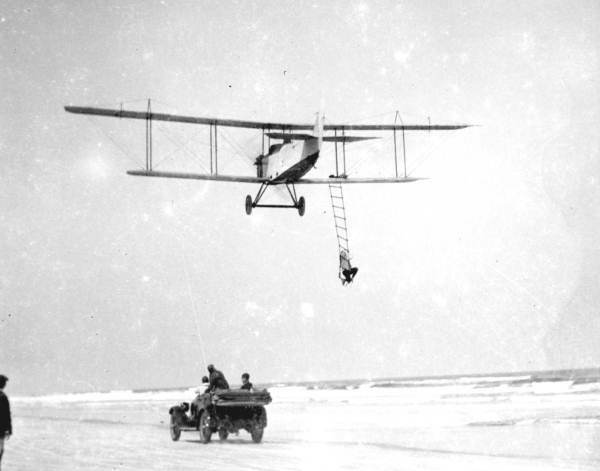 A 1999 article in the Florida Times-Union – The Flight of Fearless Mabel – describes several of her unsuccessful attempts to transfer from a speeding car to an airplane. In addition to the photo shown here, the video clip below shows that Mabel became quite capable of performing that feat.